Curved, solid round mouthpiece with narrow upward curve in center. Wider curve and tongue allowance than EM 12. Function: Creates bar pressure and some tongue pressure. More tongue relief than an EM 12 but not as much as an EM 15. 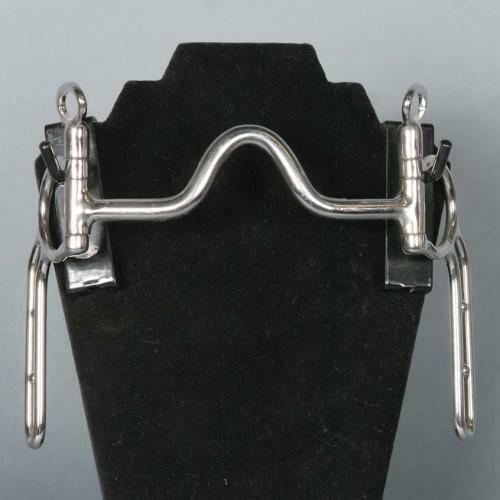 Usage/Solution: The Myler Low Port mouthpiece works well for the finished horse working primarily off the bars. The narrow and higher curve of the port would be suitable for horses with a low palate and narrow tongue. Unlike the EM 12, it can be high enough to work off the palate on a horse with a low palate. works well with single or in a team for driving or in multiples.